Hotei, one of the Seven Lucky Gods, was the god of happiness and good fortune. He is often depicted in loose clothes, with a large hairy stomach, leaning comfortably on a large bag of treasures. 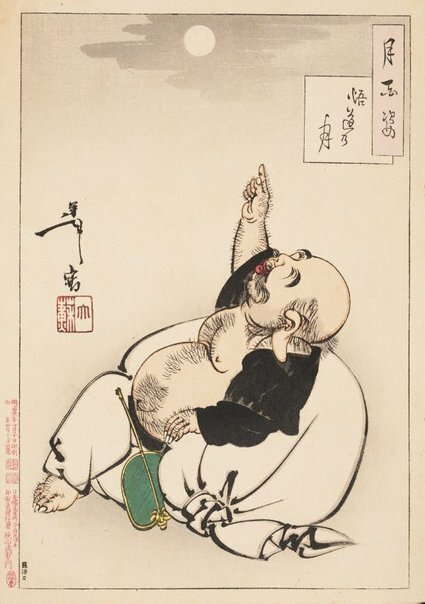 A famous theme of Zen painters, Hotei is shown pointing childlike to the moon as it suddenly appears from behind the clouds. The appearance of the moon served as both an awakening for Hotei and a lesson to the viewer: not to confuse the finger that points at the moon with the moon itself.